For Christian feminist theologians fighting patriarchy within the church and within the larger Christian religious tradition, the patriarchal image of God is an issue of primacy. As many battles as feminists and egalitarian reformers may win, whether it be the ordination of women or a simple revocation of the one-sided dictate for wives to submit to their husbands, the ultimate head of the church remains a patriarchal deity. Woman remains therefore, symbolically if not spiritually and practically, subordinate to man. To reconcile this inequity between man and woman as imago Dei, theologians have turned to the scriptures (canonical and apocryphal) and to the history of scriptural interpretation and lived faith to determine whether Christianity is an intrinsically patriarchal tradition or if it has simply been hijacked by men “who have made God in their own image” (Engelsman 1994, 156). If god is not wholly male, in image and in nature, then the Christian tradition is not intrinsically patriarchal and can evolve to meet modern standards of equality. This post will not explore the concept of the Judeo-Christian god as a necessarily literal being having a set gender or nature. Herein the concept of god will receive treatment as a mythic character, subject to the mores of changing culture and evolving tradition. The nature of this god is best described as unknowable, transcending understanding, without limitation. Therefore, when we speak of the gender of god we are speaking not of literal gender but of the metaphors used to describe some divine attribute in a way that humankind can relate to it. When exclusively male-gender god metaphors are used, women are excluded from the central religious body and relegated to a lower spiritual standing than men. If female-gender god metaphors exist, and have existed from the beginning of the tradition, then the patriarchy of the current tradition is a construct not of the founders of the faith but of later men with an agenda and ideology askew of the tradition’s original intent. Rosemary Radford Ruether’s book, Sexism and God-Talk, explores biblical language about god as it relates to sexism and the “sacralization of patriarchy.” Ruether describes the dualism of the ghost in the machine as equating man with the spirit and woman with the flesh. The theme of male-sanctioned denigration of female carnality is pervasive in feminist theology. Ruether relates that, though the Judeo-Christian god is rife with patriarchal undertones, his hypostasis, the Holy Spirit, is surrounded with feminine imagery and that this femininity is useful in refuting sexist arguments against the spiritual capacity of woman (Ruether 1993, 61). 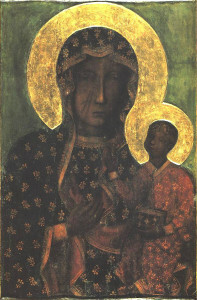 In the 1993 book Black Madonnas, feminist cultural historian and Professor of Women’s Spirituality at the California Institute of Integral Studies, Lucia Chiavola Birnbaum details a thirteenth century movement that envisioned history as divided into three spiritual ages: the age of the Father, the age of the Son, and the age of Spiriti Santo. Spiriti Santo, or the Holy Spirit, was interpreted as the feminine aspect of God. The mystic Joachim of Fiore founded the movement which the nun Guglielma of Milan then continued. Guglielma took Joachim’s belief in the age of Spiriti Santo and claimed that the age would reveal the necessary role of woman in the salvation of humankind. This movement was quickly extinguished by the Catholic Church, but the theme of the sacred feminine’s existence in the Trinity persisted in myths, folk tales and fringe theological thought (Birnbaum 1993, 158). Seemingly maternal descriptions of the Holy Spirit in the Gospel of John are often used to argue the dualistic androgyny of god. For instance, in John 1:32 we read, “I saw the Spirit descending from heaven like a dove, and it abode upon him.” John continues in verse 33, “[He] that sent me to baptize with water, the same said unto me, Upon whom thou shalt see the Spirit descending, and remaining on him, the same is he which baptizeth with the Holy Ghost.” The dove is a feminine image often used to describe the Holy Spirit and other feminine personifications of god’s immanence. Water is associated with the Spirit and the Word in Genesis where “[The] Spirit of God moved upon the face of the waters,” (Gen. 1:2) and John where “In the beginning was the Word, and the Word was with God, and the Word was God.” (John 1:1). However, Ruether and other feminists reject the Holy Spirit as the sole manifestation of the feminine in the divine, stating that, in this scenario, male-gender god metaphors would still dominate the Trinity (Ruether 1993, 61). In her 1999 book, Sensing the Spirit, Rebecca Button Prichard describes the Holy Spirit (רוח, πνεύμα, spiritus) as the breath of life breathed into humanity by God (Prichard 1999, 124). She calls this breath the Ruach (alternately: Ruach HaKodesh, Ruach Elohim) or spirit, breath, air. Here the Spirit is linked to the creative power of the Word (or Mathrem) that set the world in motion. In Cabalistic and Zoroastrian tradition, the Spirit is the Spenta Mainyu or creative force (Stavish 1998). As the creative force and divine spark sent by the Word to vivify humanity, the Spirit is similar in attribute to Shekinah, who, in the Cabalistic Tree of Life, is the opening between the divine womb (Binah) and humanity (Malkuth) (Prichard 1999, 86). In rabbinic tradition, Shekinah (שכינה) is the indwelling of god within humanity. Shekinah is present within and near us as god’s immanent force. For rabbis at the inception of the tradition, there was little or no distinction between the Spirit and Shekinah. The relatedness of Shekinah to the Spirit is important to feminist theology because Shekinah is decidedly feminine and also relates to the concept of faith as a lived experience in Shekinah’s close connection to the concept of tikkun (תיקון) or “gathering the sparks,” a concept centered around the idea that god’s feminine aspect (Shekinah) has been lost—scattered—and must be restored in order to make the world, humankind and god whole once more (Prichard 1999, 85). In her 1992 book on feminist theology, She Who Is, Elizabeth A. Johnson discusses the plausibility of the femininity of some or all aspects of god. When discussing the Holy Spirit, Johnson explains that the etymology of the word spirit is ambiguous in gender. Whether the Hebrew ruab (or ruach, רוח -feminine), Greek pneuma (πνευμα -neuter) or Latin spiritus (masculine), the gender of the word is of little importance (Johnson 1992, 83). In his 1980 essay, The Ordination of Women, theologian Paul K. Jewett explains the unimportance of a word’s gender to its function, specifically for the word ‘spirit.’ Jewett explains that since the Spirit is often imaged as an impersonal force—perhaps a gust of wind or a flame—Christians have tended to view the Spirit as an ‘it’ rather than a ‘he’ or ‘she.’ Jewett elaborates, stating, “When speaking of the Spirit, therefore (in distinction to the Father and the Son) our language problem is somewhat different. Rather than remind ourselves that the pronoun ‘he’ is personal (generic), not masculine (specific), we have to remind ourselves that the pronoun ‘he’ is not neuter,” (Jewett 1980, 47). In other words, we use a personal pronoun for the Spirit instead of an impersonal one to remind ourselves of the personhood of the Spirit as a member (or hypostasis) of the Trinity. In many Gnostic and apocryphal works, feminine imagery for the Spirit abounds. In the Gospel According to the Hebrews, Jesus is quoted as saying, “Then my Mother, the Holy Spirit…” In The Acts of Thomas, the expression “the Holy Spirit, the Mother of all creation,” is used. According to Jewett, “The Mandaeans and Ophites called the Spirit ‘the first woman’ and ‘the Mother of all living.’” For the Valentinians, the Spirit as a dove represented “the word of the Mother from above.” According to theologian Peter Gerlitz, speculation on the Holy Spirit as feminine was common among certain Christian sects before they were suppressed post Council of Nicene (Jewett 1980, 49). 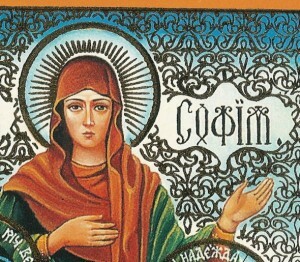 For Sophia, which is the worker of all things, taught me: for in her is an understanding spirit, holy, one only. . . For she is the breath of the power of God, and a pure influence flowing from the glory of the Almighty . . . And being but one, she can do all things: and remaining in herself, she maketh all things new: and in all ages entering into holy souls, she maketh them friends of God and prophets. For God loveth none but him that dwelleth with Sophia. For she is more beautiful than the sun, and above all the order of stars: being compared with the light, she is found before it. For after this cometh night: but vice shall not prevail against wisdom. Biblical scholars have produced numerous interpretations for the identity of Sophia ranging from abstract metaphor for cosmic order to almost independent divine personification similar in status to the other members of the triune god (Johnson 1992, 91). In the Gospel of Matthew, Sophia is portrayed as the divine mother of Jesus—a status generally accorded the Holy Spirit (Matt. 1:18). A problem scholars encounter, when interpreting the identity of Sophia, is that she presents a fourth division in the Trinity, creating a quaternity; which, while an attractive parallel to the Tetragrammaton, flies in the face of Christian tradition. Few theologians, feminists and reformers included, are interested in questioning the veracity of Deus Triunus; which is interesting since a fourth personification of god, and a feminine one at that, would balance the masculine and feminine attributes of YHVH (יהוה). 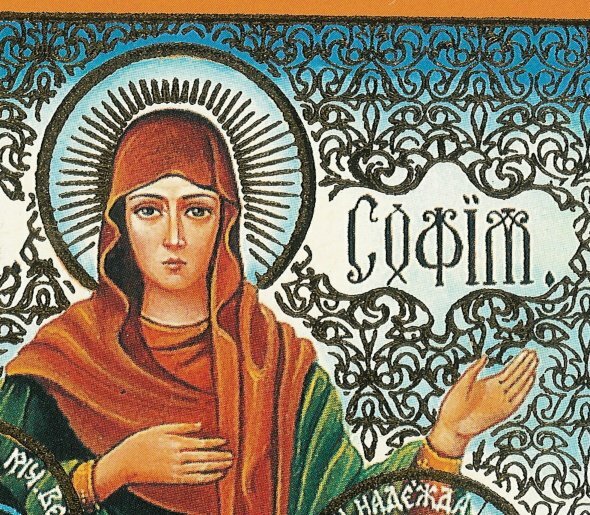 The rejection by feminist scholars of this interpretation of Sophia evidences the strength of their conviction that Sophia is not a fourth manifestation of the divine. If we accept the concept of the Trinity at the outset, then the most reasonable conclusion is that Sophia is another name for one of the aspects of the Trinity. Johnson argues that the immanence of Sophia most closely resembles Jesus, citing several sources that liken Jesus, the Word, with dynamic Wisdom both informing and creating (Johnson 1992, 94-98). However, the dual roles of Sophia as both son and mother, male and female, strain this interpretation. This seeming androgyny, while perhaps of interest to LGBT advocates, is of little import or sway here. Also, Sophia, like the other non-incarnate aspect(s) of god, lacks any real tradition of physical manifestation—unless one counts a burning bush. Biblical and extra-biblical anthropomorphic imagery for Sophia is metaphorical, whereas the humanity of Jesus is literal. Equating Jesus to Sophia serves only to abstract his personhood and lesson her reality. With her role as mother and inspirational force, Sophia presents herself as the personification of god’s immanence. Her similarity to Spiriti Santo is hard to deny, both in her apparent abstraction and in her immanence. As Joan Chamberlain Engelsman states in The Feminine Dimension of the Divine, “Sophia [is the] expression of the great feminine archetypes… she is identified with the spirit of God,” (Engelsman 1994, 81). If we merge these two god metaphors, their respective feminine characteristics only increase the strength of the argument that the Holy Spirit is a wholly feminine aspect of the triune god. Here also we may interpret Shekinah as one more name for, and instantiation of, Spiriti Santo. Thus we have a rich tradition of common symbols, disparate until now only in name—a disparity due to patriarchal suppression. Church leaders and teachers have suppressed this conception of the Holy Spirit as the feminine aspect of the divine by separating her many images from one another and therefore from the person of god. Much as Shekinah was, in ancient tradition, scattered throughout the earth, so too has her true identity—Spiritus Sanctus—been scattered. Thus the holy work of the believer, Tikkun, is once more upon us; and it is the feminist and the womanist who has taken up the task of repairing a damaged faith. This repair is necessary for both genders, as inequality engenders strife. A god of both male and female attributes is a much more whole god, more capable of fulfilling those believers who strive to reflect the imago Dei. As Joan Chamberlain Engelsman observes, “[An] image of God with both masculine and feminine dimensions would dramatize the intrasexual harmony of the divine which human beings could emulate in their own interpersonal relationships,” (Engelsman 1994, 156). Thus the complimentary dualism of god serves as a guide to the faithful who, becoming one flesh, may complement each other in an equal and mutually beneficial way. Here we have seen that scripture does not render the Judeo-Christian deity as solely masculine. From Shekinah/Hokmah in Hebrew scriptures to the Holy Spirit/Sophia in Christian literature, various instantiations of god’s immanence bear feminine qualities. These instantiations, together with the images and metaphors surrounding them, bear striking resemblance to one another and are easily interpreted as the same hypostasis—the Spiriti Santo. While acknowledgement of one aspect of the divine as feminine does not instate equality to the sexes, it certainly opens a door. Birnbaum, Lucia Chiavola. 1993. 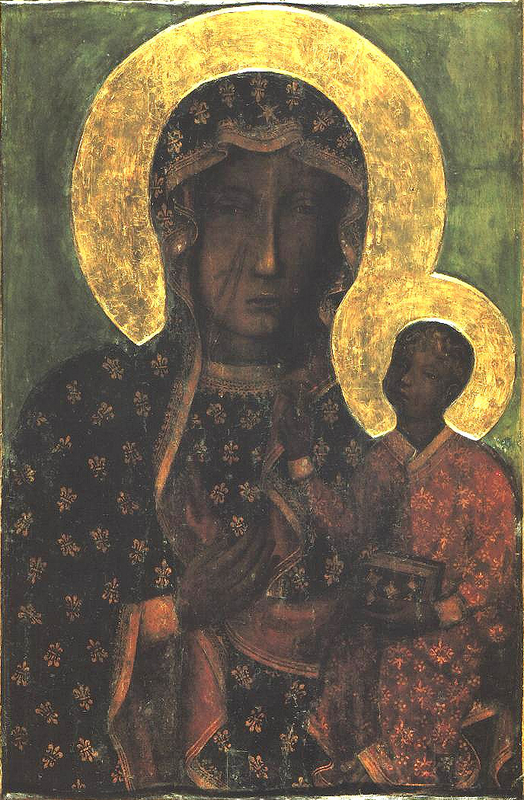 Black Madonnas: Feminism, Religion & Politics in Italy. New York: toExcell. Engelsman, Joan Chamberlain. 1994. The feminine dimensions of the divine Illinois: Chiron Publications. Jewett, Paul K. 1980. The Ordination of Women. Grand Rapids: Eerdmans. Jewett, Paul K. 1990. Man as Male and Female. Grand Rapids: William B. Eerdmans Publishing Company. Prichard, Rebecca Button 1999. Sensing the Spirit: The Holy Spirit in Feminist Perspective. Atlanta: Chalice Press. Ruether, Rosemary Radford. 1993. Sexism and God-Talk. Boston: Beacon Press. Starbird, Margaret. 1998. The Goddess in the Gospels. Rochester: Bear & Company. Stavish, Mark. 1998. “Secret Fire: The Relationship Between Kundalini, Kabbalah, and Alchemy” (“essay”) in Corpus Stavish: The Writings of Mark Stavish (The Alchemy Website), http://www.levity.com/alchemy/secret-fire.html (accessed August, 01 2007). I’ve looked through my library and can’t locate anything even suggesting this. Sounds like a great dream though. Let me know if you find anything. UPDATE: I was messing around with Google Ngrams recently and stumbled upon a note in Personality and Office of the Christian Comforter Asserted and Explained: In a Course of Sermons on John XVI.7., Preached Before the University of Oxford, in the Year MDCCCXV. (1815) by Reginald Heber. It’s a quote from another text, and it reminded me of your question.